There are 130 official ways for an infant to die. These official categories of death, sanctioned by the Centers for Disease Control and Prevention (CDC) and the World Health Organization (WHO), are published in the International Classification of Diseases (ICD).1-3 When a baby dies, coroners must choose from among these 130 categories. The official causes of death listed in the ICD include nearly every imaginable — and tragic — possibility. However, there is NO category for infant deaths caused by vaccines.4 This is odd because the federal government is aware that vaccines permanently disable and kill some babies — the very reason Congress established a “death and disability” tax on childhood vaccines more than 25 years ago when the National Childhood Vaccine Injury Act of 1986 (Public Law 99-660) created the National Vaccine Injury Compensation Program (VICP). Are some deaths that are listed within the 130 infant mortality death categories really deaths that are associated with vaccination? Are some vaccine-related deaths hidden within the death tables? Throughout the 1980s, sudden infant deaths continued to skyrocket. Parental concerns about an apparent link between childhood vaccines and SIDS reached a fever pitch. Many parents were afraid to vaccinate their babies. Authorities sought to reassure parents that vaccines are safe and claimed that sudden unexplained infant deaths following vaccines were merely coincidental. In 1992, the American Academy of Pediatrics (AAP) came up with a plan to reduce the unacceptable SIDS rate while reassuring concerned moms and dads that sudden unexplained infant deaths were not related to vaccines. The AAP initiated a national “Back to Sleep” campaign, telling parents to place their infants supine, rather than prone, during sleep. From 1992 through 2001, the post-neonatal SIDS rate dropped by an average annual rate of 8.6%. It seemed as though the “Back to Sleep” campaign was successful and that the real cause of SIDS was due not to vaccinations but from babies sleeping on their bellies. However, a closer inspection of the ICD — the 130 official ways for an infant to die — revealed a loophole. Medical certifiers, such as coroners, could choose from among several categories of death when a baby suddenly expired. They didn’t have to list the death as SIDS. Although the post-neonatal SIDS rate dropped by an average annual rate of 8.6% from 1992 through 2001 following the AAP’s seemingly successful “Back to Sleep” campaign, the post-neonatal mortality rate from “suffocation in bed” (ICD-9 code E913.0) increased during this same period at an average annual rate of 11.2%. Sudden, unexplained infant deaths that were classified as SIDS prior to the “Back to Sleep” campaign, were now being classified as deaths due to suffocation in bed! Figure 1. The postneonatal SIDS rate appears to have declined from 61.6 deaths (per 100,000 live births) in 1999 to 50.9 in 2001. 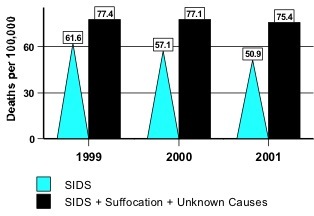 However, during this period there was a significant increase in post-neonatal deaths attributed to “suffocation in bed” and due to “unknown causes.” When these sudden unexpected causes of infant deaths are combined with SIDS deaths, the total SIDS rate remains relatively stable, resulting in a non-significant decline. Figure 2. In a study of 103 children who died of SIDS, more than two-thirds had been vaccinated with pertussis prior to death. Of these, 6.5 percent died within 12 hours of vaccination; 13 percent within 24 hours; 26 percent within three days; and 37, 61, and 70 percent within one, two, and three weeks, respectively. Our beautiful 2-month-old daughter recently died. What was unusual was that earlier on the day that she died, I had taken her to the military base hospital for her two-month checkup. The doctor told me that she was just perfect. Then he said that she needed four shots. I replied, “Four!”? She assured me that it was completely normal. For example, a vaccine against rotavirus-induced diarrhea (Rotarix) was licensed by the Food and Drug Administration (FDA) in 2008. However, in a clinical study that evaluated the safety of this vaccine, vaccinated babies died at a significantly higher rate than non-vaccinated babies — mainly due to a statistical increase in pneumonia fatalities.37 (One biologically plausible explanation is that natural rotavirus infection might have a protective effect against respiratory infection. )38 Although these deaths appear to be vaccine related, coroners are likely to have misclassified them as pneumonia. Some infant fatalities that occur shortly after vaccinations are incorrectly classified as shaken baby syndrome. Retinal and subdural bleeding can result from an adult that shook the baby or from vaccine damage. Expert testimony by medical practitioners has exonerated innocent parents of all charges against them.39 This is just another example of how the true cause of death can be reclassified or hidden within the death tables. The practice of reclassifying ICD data greatly concerns the CDC “because inaccurate or inconsistent cause-of-death determination and reporting hamper the ability to monitor national trends, ascertain risk factors, and design and evaluate programs to prevent these deaths.”40 Thus, medical certification practices need to be monitored to determine how often vaccine-related infant deaths are being reclassified as ordinary mortality in the ICD. More importantly, parents need to be warned that vaccine safety is grossly overestimated when vaccine-related deaths are not being accurately documented. 1. WHO. International Classification of Diseases, 9th Revision. Geneva, Switzerland: World Health Organization, 1979. 2. WHO. International Statistical Classification of Diseases and Related Health Problems, 10th Revision. Geneva, Switzerland: World Health Organization, 1992. 3. CDC. Table 31. Number of infant deaths and infant mortality rates for 130 selected causes, by race: United States, 2006. Natl Vital Stat Rep 2009; 57: 110–112. 4. ICD-6, issued in 1948, and ICD-7, issued in 1955, included “Prophylactic inoculation and vaccination” as a separate cause of death category with subcategories (codes Y40-Y49) for death due to “vaccination against smallpox” (code Y40), “inoculation against whooping cough” (code Y42), “inoculation against other infectious disease” (code Y49), etc. The ICD-8, issued in 1965, deleted the subcategories for death due to inoculation against individual diseases while maintaining “Prophylactic inoculation and vaccination” (code Y42) as a separate cause of death category. When the ICD-9 was issued in 1979, authorities removed all cause of death classifications associated with vaccination. 5. Health Resources and Services Administration. National Vaccine Injury Compensation Program. U.S. Department of Health and Human Services. (Data as of June 2, 2014). 6. The measles vaccine was administered at 9 months of age from 1963 to 1965. ACIP. Measles prevention: recommendations of the Immunization Practices Advisory Committee (ACIP). MMWR (December 29, 1989) / 38(S-9): 1-18. 7. Bergman AB, Beckwith JB, Ray CG, eds. Sudden Infant Death Syndrome. Proceedings of the Second International Conference on Causes of Sudden Death in Infants, Seattle and London: University of Washington Press, 1970:18. 8. Bergman AB. The “Discovery” of Sudden Infant Death Syndrome. New York, NY, USA: Praeger Publishers, 1986: 209 (Appendix III). 9. MacDorman MF and Rosenberg HM. Trends in infant mortality by cause of death and other characteristics, 1960-88 (vital and health statistics), Volume 20. Hyattsville,MD, USA: National Center for Health Statistics, U.S. Government Printing, 1993. 10. Malloy MH and MacDorman M. Changes in the classification of sudden unexpected infant deaths: United States, 1992-2001. Pediatrics 2005; 115: 1247–1253. 11. Willinger M, James LS, Catz C. Defining the sudden infant death syndrome (SIDS): deliberations of an expert panel convened by the National Institute of Child Health and Human Development. Pediatr Pathol 1991; 11: 677–84. 12. Goldwater PN. Sudden infant death syndrome: a critical review of approaches to research. Arch Dis Child 2003; 88: 1095–100. 13. Vaccine Injury Compensation. Hearing Before the Committee on Labor and Human Resources; 98th Congress, 2nd Session, (May 3, 1984): 63-67. 14. Mitchell E, Krous HF, Donald T, and Byard RW. Changing trends in the diagnosis of sudden infant death. Am J Forensic Med Pathol 2000; 21: 311–314. 15. Overpeck MD, Brenner RA, Cosgrove C, Trumble AC, Kochanek K, and MacDorman M. National under ascertainment of sudden unexpected infant deaths associated with deaths of unknown cause. Pediatrics 2002; 109: 274–283. 16. Byard RW and Beal SM. Has changing diagnostic preference been responsible for the recent fall in incidence of sudden infant death syndrome in South Australia? J Pediatr Child Health 1995; 31: 197–199. 17. Vennemann MM, Butterfass-Bahloul T, Jorch G, Brinkmann B, Findeisen M, Sauerland C, et al. Sudden infant death syndrome: no increased risk after immunisation. Vaccine 2007; 25: 336–340. 18. Stratton K, Almario DA, Wizemann TM, and McCormick MC. Immunization safety review: vaccinations and sudden unexpected death in infancy. Washington DC, USA: National Academies Press, 2003. 19. Essery SD, Raza MW, Zorgani A, MacKenzie DA, et al. The protective effect of immunisation against diphtheria, pertussis and tetanus (DPT) in relation to sudden infant death syndrome. FEMS Immunology and Microbiology 1999 August 1; 25(1-2): 183-92. 20. Madsen T. Vaccination against whooping cough. JAMA 1933; 101: 187-88. 21. Werne J and Garrow I. Fetal anaphylactic shock: occurrence in identical twins following second injection of diphtheria toxoid and pertussis antigen. JAMA 1946; 131: 730-35. 22. Kalokerinos A. Every Second Child Was Doomed to Death — Unless One Dedicated Doctor Could Open His Colleagues’ Eyes and Minds. New Canaan, CT: Keats Publishing, Inc., 1974. 23. Noble GR., et al. Acellular and whole-cell pertussis vaccines in Japan: report of a visit by U.S. scientists. JAMA 1987; 257: 1351-56. 24. Cherry JD., et al. 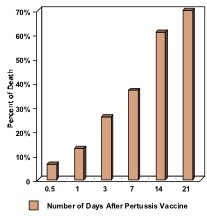 Report of the task force on pertussis and pertussis immunization. Pediatr (Jun 1988); 81(6): 933-84. 25. Congressional Budget Office. Factors contributing to the infant mortality ranking of the United States. CBO Staff Memorandum (February 1992): Table 2, International Infant Mortality Rates by Ranking. 26. Goldman GS and Miller NZ. Relative trends in hospitalizations and mortality among infants by the number of vaccine doses and age, based on the Vaccine Adverse Event Reporting System (VAERS), 1990–2010. Human and Experimental Toxicology 2012; 31(10): 1012-1021. 27. Torch WC. DPT immunization: A potential cause of the sudden infant death syndrome (SIDS). Amer Acad of Neur, 34th Annual Meet, Apr 25-May 1, 1982. Neur 32(4): pt. 2. 28. Baraff LJ, Ablon WJ, Weiss RC. Possible temporal association between diphtheria-tetanus toxoid-pertussis vaccination and sudden infant syndrome. Pediatric Infectious Disease Journal 1983; 2: 7-11. 29. Walker AM., et al. 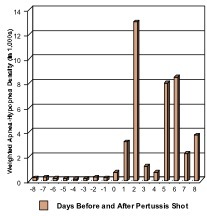 Diphtheria-tetanus-pertussis immunization and sudden infant death syndrome. Am J Public Health (August 1987); 77(8): 945-51. 30. Scheibner V. and Karlsson LG. Evidence of the association between non-specific stress syndrome, DPT injections and cot death. Proceedings of the 2nd National Immunisation Conference in Canberra (May 27-29, 1991). 31. Scheibner V. Vaccination: 100 Years of Orthodox Research Shows that Vaccines Represent a Medical Assault on the Immune System. Blackheath, NSW, Australia: Scheibner Publications, 1993: 59-70; 225-235; 262. 32. Scheibner V. Dynamics of critical days as part of the dynamics of non-specific stress syndrome discovered during monitoring with Cotwatch breathing monitor. Journal of the Australasian College of Nutritional & Environmental Medicine (December 2004); 23(3): 1-5. 33. Ottaviani G, Lavezze AM, and Matturri L. Sudden infant death syndrome (SIDS) shortly after hexavalent vaccination: another pathology in suspected SIDS? Virchows Archiv 2006; 448: 100–104. 34. Zinka B, Rauch E, Buettner A, Rueff F and Penning R. Unexplained cases of sudden infant death shortly after hexavalent vaccination. Vaccine 2006; 24(31-32): 5779–5780. 35. Kuhnert R, Hecker H, Poethko-Muller C, Schlaud M, Vennemann M, Whitaker HJ, et al. A modified self-controlled case series method to examine association between multidose vaccinations and death. Stat Med 2011; 30(6): 666–677. 36. Unsolicited correspondence received by the Thinktwice Global Vaccine Institute. 37. GlaxoSmithKline. Rotarix1 (Rotavirus Vaccine, Live, Oral) Oral Suspension. Product insert from the manufacturer (April 2008): 6. 38. FDA. Center for biologics evaluation and research, vaccines and related biological products advisory committee meeting (February 20, 2008): 127–128. 39. Buttram H and England C. Shaken Baby Syndrome or Vaccine-Induced Encephalitis: Are Parents Being Falsely Accused? Bloomington, Indiana: Author House, 2011. 40. CDC. About the sudden unexpected infant death investigation (SUIDI) reporting form. Department of Health and Human Services (accessed May 13, 2013). This entry was posted in Human Behavior, Lifestyle Health, Medical Studies, Odd Medical Practices, Tele-Medicine, Telemedicine Reporter and tagged 131 Ways, AAP, diphteria, DPT, For An Infant, measles, National Telemedicine Foundation, NTF, Pertussis, SIDS, telemedicine, tetanus, to die, vaccines by Admin. Bookmark the permalink. super information of vaccine for children.